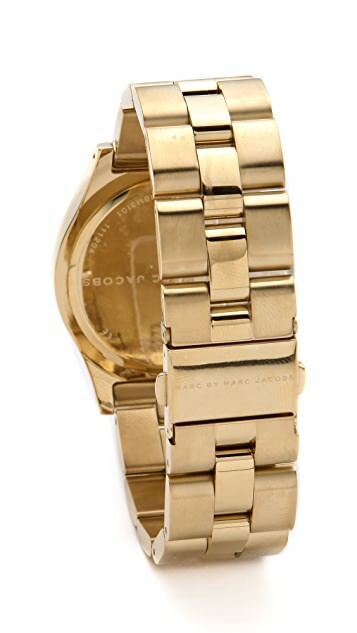 This water-resistant, gold-tone stainless steel watch features brushed and polished links at the band. Logo lettering at bezel. Crystal markers, chronograph, and date wheel at dial. Hinged snap closure. Japanese movement. Fantastic watch. I like the fact that it is heavy and more a mans size. LOVE!! 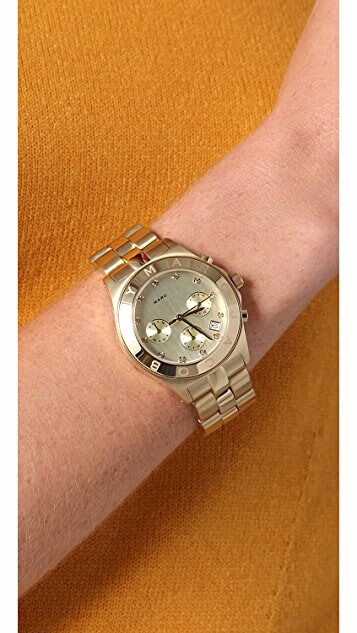 This watch is a perfect size and is a good every day watch. I didn't realise that the hour dots were diamontes, which i wasn't a fan of. Apart from that, I love it. I ordered it on a thursday, and it got delivered on monday! Very fast delivery :-) The watch is perfect, exactly what i wanted. And I've gotten a loooot of compliments. Just love it! I bought this watch for a friend of mine, and the watch arrived three days after the transaction date! 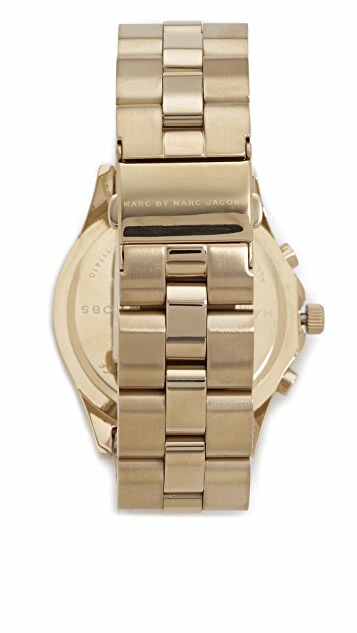 Loving the free shipping over $100 and love the Marc Jacobs watch. This was larger and heavier than expected, but is a great watch nonetheless. It's heavy duty too - I've worn it for over a year and can barely see any scratches on it. Great for all occasions and every time I wear it, I receive compliments. Recommended! 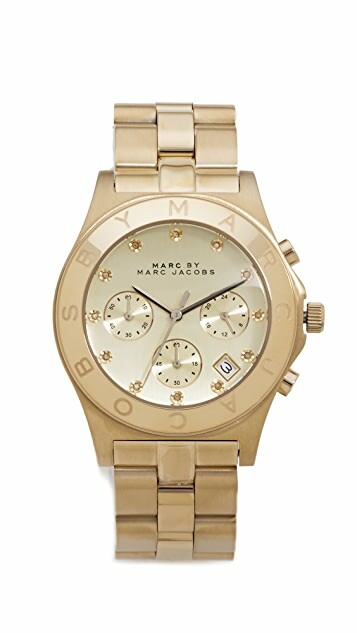 This is my favourite watch I can wear it out at night or everyday at work the soft gold is beautiful!! Love this watch! I get compliments on it all the time (from men and women) . I have very small wrists, so I was concerned about the face looking too big, but it fits perfectly. Very happy with this purchase! This watch is truly amazing. It is incredibly versatile and works with almost any outfit. When I purchased this watch, I was worried that the face of the watch would be bulky however it is the perfect size. I regularly receive compliments on this watch. You will not be disappointed!